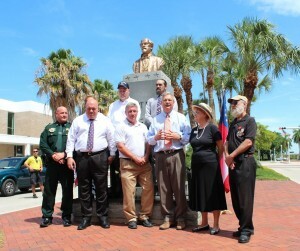 During an 11 a.m. ceremony today, Lee County Commissioner Cecil Pendergrass and Mayor Randy Henderson unveiled a completely restored and refurbished bust of county namesake Robert E. Lee sitting proudly once again atop the gleaming gray Georgia granite pedestal in the median on Monroe Street between First and Bay. Commissioned at a cost of $6,000 by the now defunct Laetitia Ashmore Nutt Chapter of the United Daughters of the Confederacy (chapter 1447), the bust was sculpted and cast in bronze in Italy by a sculptor named Aldo Pero. It was hoisted into place by the Crone Monument Company of Memphis, Tennessee and originally unveiled in a dedication ceremony that took place on January 19, 1966, a date selected to mark the occasion of the159th anniversary of Robert E. Lee’s birth. But the scorching Florida sun and wind, rain and humidity took its toll over the ensuing 48 years, causing the bust to lose both its luster and definition. “So we hired an expert on marker restoration who has returned the American icon and our County’s namesake to its original look,” explained Cmdr. Robert Gates of the Major William M. Footman Camp #1950 Sons of Confederate Veterans, which maintains the memorial in collaboration with the local chapter of the United Daughters of the Confederacy. Noted military historian and Estero resident Dr. Ted Childress reminded those who gathered for the unveiling and rededication why Cattle Kind and City Father Francis Asbury Hendry nominated Lee as namesake for the county when it was formed in 1887. Dr. Childress’ remarks echoed sentiments expressed more than 48 years earlier by Lloyd G. Hendry, who said at the 1966 dedication that his great-grandfather spoke of Lee’s deep and abiding concern for his fellowmen. 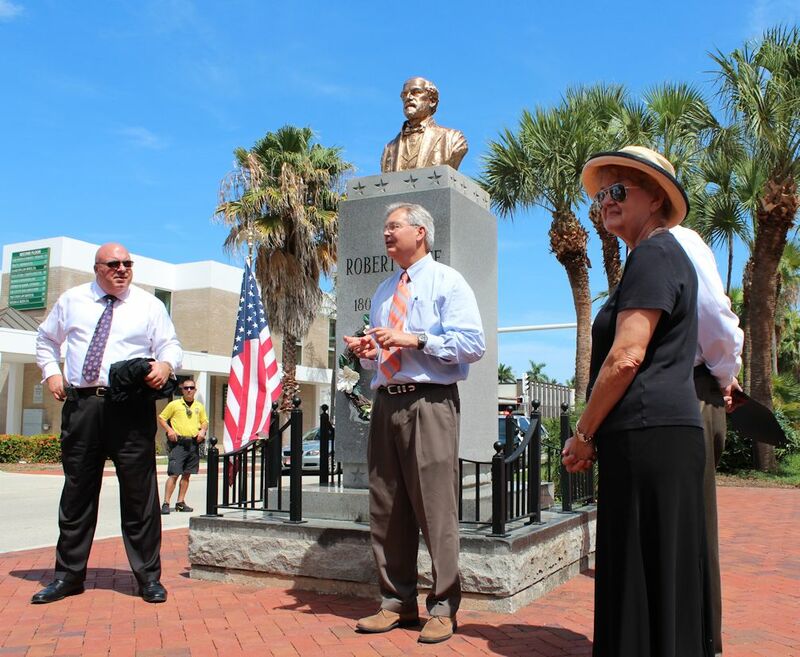 “These are the qualities the man who named Lee County hoped the people of Lee County would emulate,” Lloyd Hendry told the crowd that gathered on January 19, 1966 for the original dedication of the bust and memorial that Lee County residents helped finance. Both Commissioner Pendergrass and Mayor Henderson also emphasized the connection between the memorial and the county’s historical past. It was cattlemen like F.A. Hendry, Jake Summerlin and William H. Towles who helped the new county and fledgling city to transition from a cow town in the last third of the 19th century into one of the leading citrus producers and tourist destination in the early 1900s. Pendergrass was elected to the Lee County Board of County Commissioners’ District 2 seat in November 2012. In a vote of confidence from his colleagues, he was unanimously sworn in as chairman of the Board at his first meeting. 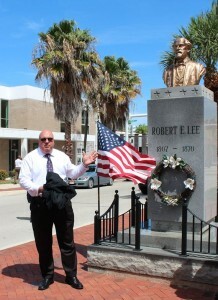 He also served as chair of the Board of Port Commissioners during his first year on the Commission. In his capacity as Lee County commissioner, Cecil serves as liaison to the Horizon Council, Public Safety Coordinating Council, Black Affairs Advisory Council, Hispanic Affairs Advisory Council, Value Adjustment Board, and Local Coordinating Board for the Transportation Disadvantaged. In addition, he serves as director on the Transportation and Expressway Authority Membership of Florida Board, and he is a member of the Lee Memorial Health System Trauma Advisory Committee. A resident of Fort Myers for more than 31 years, Henderson is now in his second term as the City’s mayor. He was born and raised in North Carolina where he graduated from Mars Hill College in 1979 with a BS in business administration. The mayor’s career in Fort Myers began in banking where he worked his way up to Vice-President. He left banking in 1986 and assumed operating responsibilities for Corbin Henderson Company, a real estate firm, as president. Henderson is especially proud of the strides the city has taken to establish itself as a family-friendly destination known worldwide for its rich historical tradition, preservation and history-affirming public artworks. 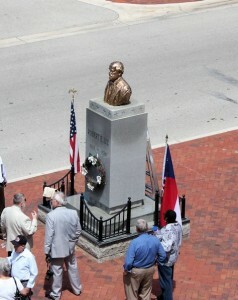 During his comments, Henderson reminded the crowd of other historical markers in downtown Fort Myers such as the Seminole Indian and Civil War mural in the courtyard off First that is shared by the federal courthouse and Hotel Indigo and the Don Wilkins monument in Centennial Park that pays tribute to the 178,000 black soldiers and 18,000 sailors who fought on the side of the Union in the Civil War. 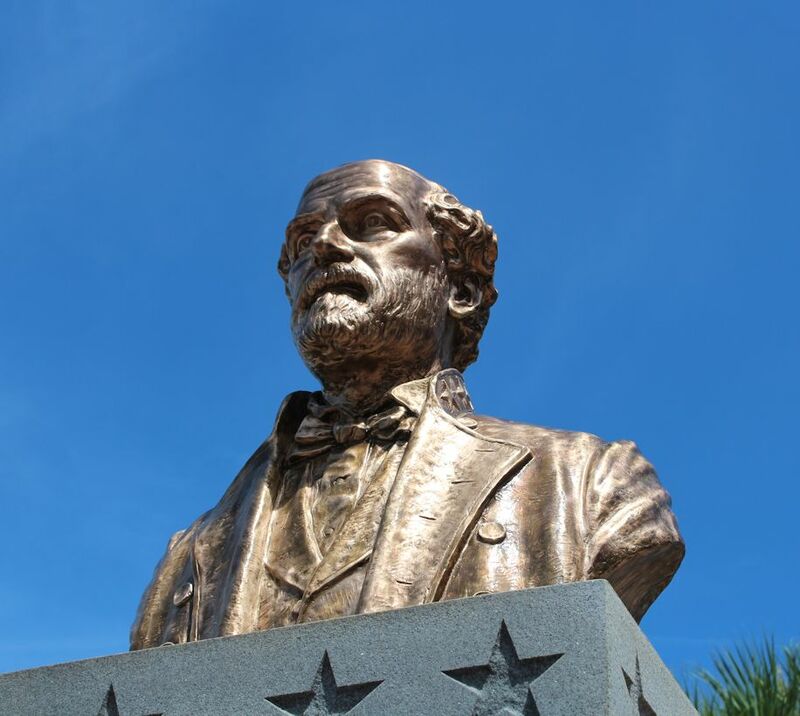 The Robert E. Lee Memorial is one of the public artworks that is visited on the True Tours Public Art Walking Tour. To hear the complete story of how and why Capt. F.A. 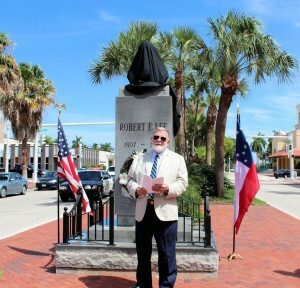 Hendry nominated Robert E. Lee to serve as namesake of the new county when it was being formed, please call True Tours at 239-945-0405 for days, times and reservations.